Cherries are the fruit of summer. First to appear are sweet cherries, large crisp globes of juicy flesh, perfect for eating fresh by the handful. A few weeks later, tart (or sour) cherries arrive, bringing with them a frenzy of pie-baking, canning and freezing. There are literally dozens (perhaps hundreds) of cultivars of both sweet and tart cherries, many well-known, others grown only in the small towns and hamlets where they’ve been nurtured in obscurity for centuries. Tart cherries are an especially important traditional fruit in Eastern Europe where they play a major role in the culture and cuisine of the region. In their native Hungary, tart cherries are one of the first fruits to ripen in the summer and the fresh, plump fruit are eagerly anticipated each year. A relative newcomer to the tart cherry scene, the Balaton cherry is the result of a special breeding program initiated in 1981 by Michigan State University horticulturalist Dr. Amy Iezzoni. After visiting many Eastern European countries where old heirloom varieties of tart cherries are still lovingly cultivated, Dr. Iezzoni was especially impressed by the traditional cherries grown in Hungary. After several years of development in cooperation with Hungarian researchers, the Balaton cherry, named for Hungary’s largest lake, was introduced in 1984, reaching significant commercial production within 15 years. What makes Balaton cherries so special? 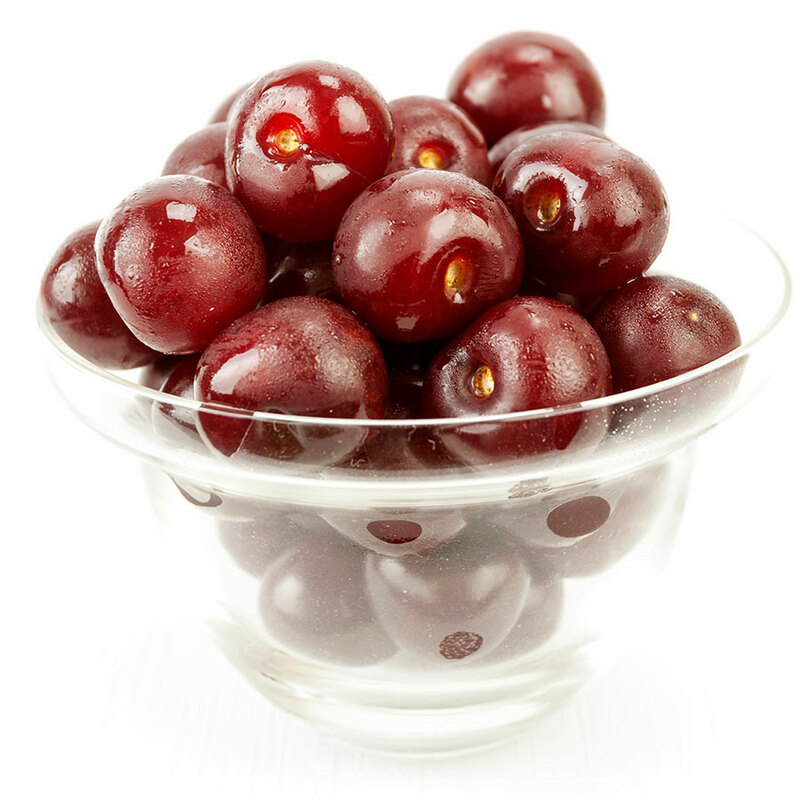 To start with, the Balaton cherry is larger, plumper and significantly more flavorful than other red tart cherries traditionally used in cherry pies, tarts, jams and preserves. This combined with the Balaton cherry’s deep, natural purplish-red pigment makes it especially attractive to pie makers and pastry chefs. This intense red color makes artificial red food coloring a thing of the past and the sweetness of the fruit reduces the amount of sugar needed in cherry pies and other favorites. Unlike sweet cherries, fresh Balaton cherries are hand-harvested without the stem. When Balaton cherries ripen, they lay down a special cell layer at the stem attachment, called the abscission layer, that “seals” off the fruit. When the fruit is ripe, the fruit naturally separates from the stem and the fruit is “protected” from outside air via a fully developed abscission layer. Thus, flavorful, fully ripened Balaton fruit are naturally stemless. 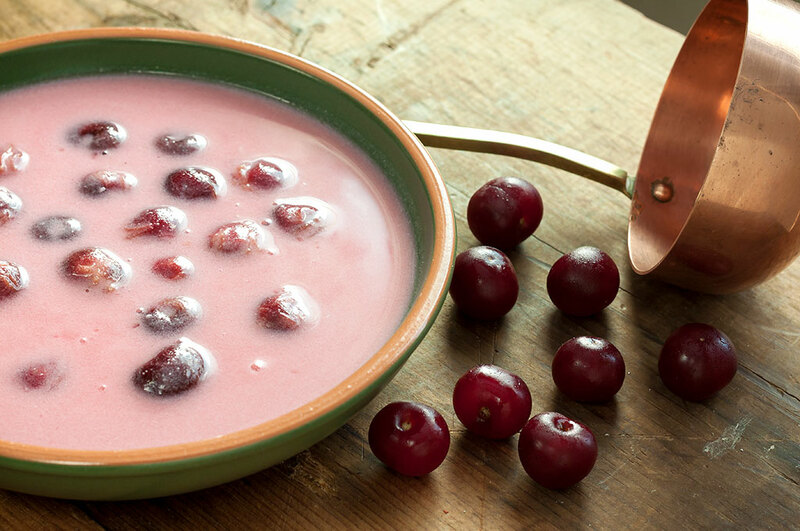 This refreshing soup made with tart cherries is a traditional summertime treat in Hungary. Every Hungarian family has its own “secret” recipe, of course, but this version comes very close to most of them. In Hungary, this soup is generally served before the main course and the cherries are un-pitted. You can pit them, if you prefer, but spitting out the pits is a big part of the fun. Add the cherries and the sugar to 1 quart of water in a large saucepan. Bring to a boil. Reduce the heat to medium and add the cinnamon sticks and cloves. Cook for about 10 minutes or until the cherries are soft. In a medium-sized bowl, mix the sour cream or yogurt with the flour and a generous pinch of salt. Temper this mixture by stirring in a cup of the hot cherry liquid until smooth. Stir the sour cream mixture into the hot cherry soup. Simmer on the lowest possible heat for about 5 minutes. Remove from the heat and taste, adding a little more sugar if desired (American palates typically prefer it a little sweeter). Fish out and discard the cinnamon sticks and cloves. Allow the soup to cool to room temperature, then refrigerate until well chilled. Serve cold as a first course or light lunch on a hot summer day. This refreshingly different salad is rich with the flavors of summer. 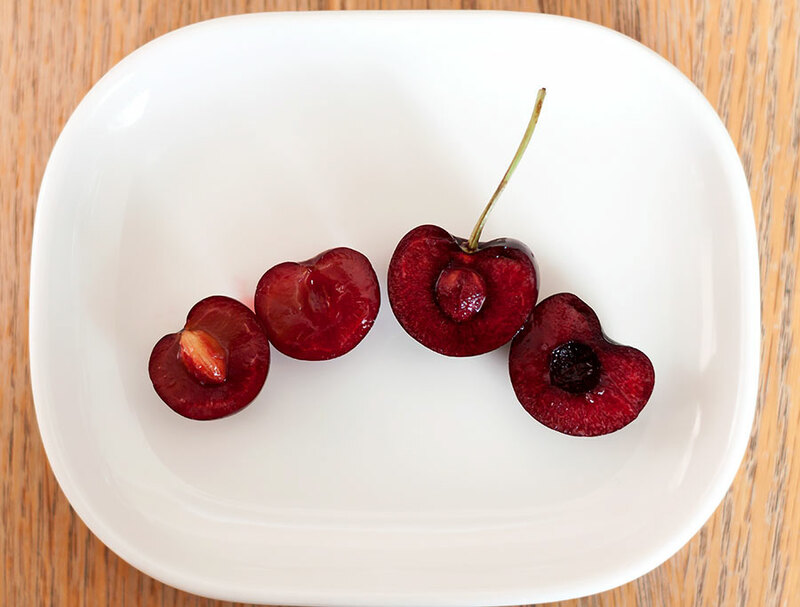 We used sweet cherries, but for a bolder flavor, try tart & tangy Balaton cherries. Try to get a spring salad mix with some robust greens, like arugula or mustard, which contribute a pleasurably spicy bite to the overall flavor. Drizzle with good quality extra virgin olive oil and balsamic vinegar to taste and enjoy. In a small bowl, combine onions with 2 cups water and lemon juice, chill 15 to 30 minutes. Drain well. Reserve a few cherries and slices of onion. Gently toss the salad greens with the remaining onions and cherries in a large bowl. Divide into serving bowls. 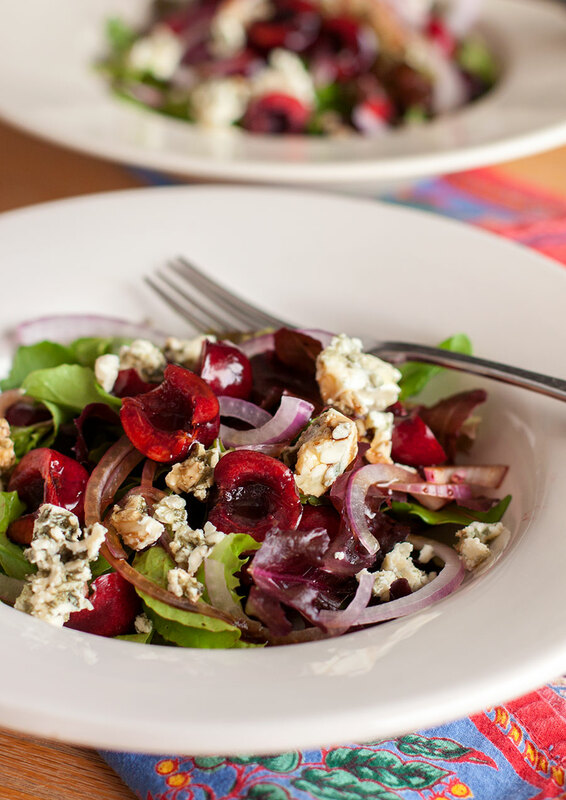 Top the salad with the coarsely crumble blue cheese, reserved cherries and onion slices. Drizzle each salad with balsamic vinegar and extra virgin olive, about 2 tablespoons of each or to taste, and season with salt and pepper.